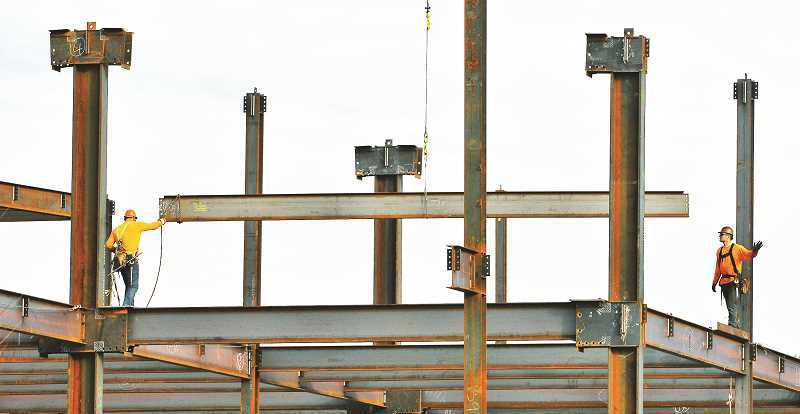 Construction is underway on the massive expansion to Providence Newberg Medical Center as iron work began going up last week and the new building starts to take form. The new, 60,000 square foot, three-story building is slated to open in late winter 2019, according to spokesman Mike Antrim. Constructing the new building will cost a total of $46.7 million. "It's finally taking shape. It's kind of exciting to see it take its form," Antrim said, adding that construction remains on schedule and on budget, and that soon people would be able to see the shell of the building. "The project is going very well." The new building will be fully occupied with Providence services once completed. Antrim said the hospital will expand its cancer services and bring patient rehabilitation into the new building as well. He added that family medicine and internal medicine providers would also be in the new building. Antrim said the expansion will allow for more laboratory space and diagnostic imaging. The expansion will allow for the hospital to add another MRI and CT machine. Providence will also add three more operating rooms for outpatient surgery in the orthopedic, gynecological and eye surgery departments as the expansion will allow the hospital to serve an addition 7,000 patients. Antrim said the hospital's foundation is raising $1 million toward completion of the project. "Heart of Gold … helps raise money for the building project and the Mike Olberding Education Fund for continuing education of medical caregivers," Antrim had previously said. The fund assists the medical center in providing for the educational needs of nurses, technicians and other hospital and service area employees. It provides tuition assistance, those returning to school for advanced degrees and fees associated with seminars, workshops and other educational events. The medical center has seen an increase of more than 44,000 new patients in the past five years and continues to see growth. The hospital's work force has continued to grow in that time as well, and the new expansion will add to its workforce. "For the medical clinic, we will add five additional providers, two additional RNs and 12 additional staff, so we will be adding approximately 20 more people," Antrim previously told the Graphic. PNMC will focus on outpatient services for about 90 percent of the building; the medical center averages about 225,000 annual visits and the need is expected to increase. With the expansion, it can provide rooms for new physicians as the need arise.